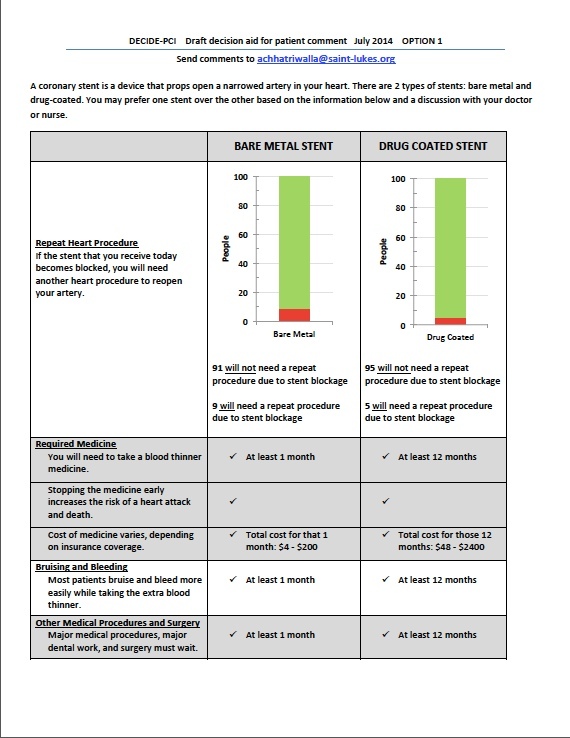 Posted on August 2, 2014, in cardiology, shared decision making and tagged Adnan Chhatriwalla, angina, bare metal stents, decision aids, drug-eluting stents, health care costs, heart disease, percutaneous coronary intervention, shared decision making. Bookmark the permalink. 1 Comment. 1. “Repeat heart procedure” is not self-explanatory. Most patients do not understand what a cardiologist means by a “procedure” or “surgery,” or what the difference is between those terms. Would the consequence of stent blockage always be insertion of another stent? If so, perhaps “repeat stent procedure” would work. 2. You need to indicate that the numbers are out of 100 people. Also suggest putting percentages in parentheses. 3. The meaning of green and red in the figure is not explained. Suggest that the relevant numbers be shown in red or green, as applicable. 4. Suggest a more explanatory label on the Y axis (e.g., “Number of people per 100 who will (red) or will not (green) need a repeat stent procedure”). 5. I wonder if there is anything beyond one year that the patient should know? 6. With respect to bleeding, how often would this result in hospitalization and serious complications? 7. Agree with the commenters who stated that it is not clear what would happen in the case of an emergency requiring surgery. 1. You need to state the time period (i.e., one year). 2. Suggest deleting all the check marks and inserting “Yes” in the boxes for stopping the medicine early. 3. The meaning of “blood thinner medicine” is not clear. 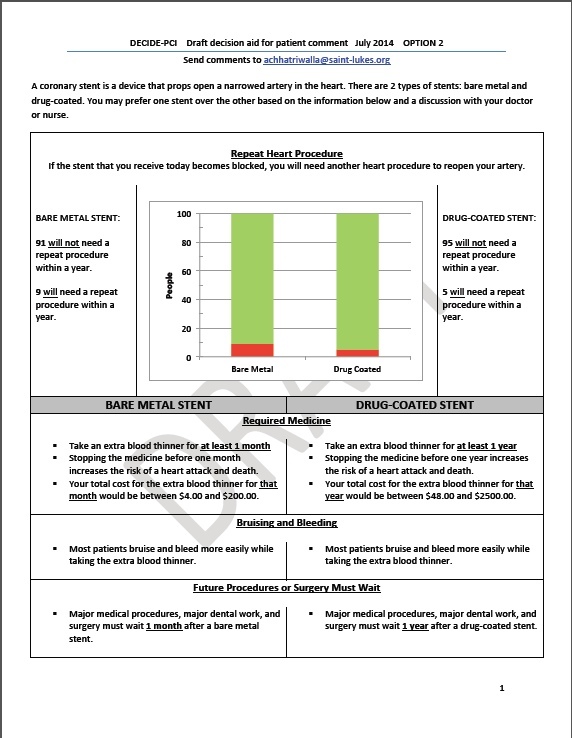 The patient needs to know that they will need to take aspirin for the rest of their life plus an extra blood thinner such a Plavix for the required period. 1. The meaning of “extra blood thinner” will not be clear to most people. You need to state that aspirin will be required indefinitely in both cases, plus an extra blood thinner such as Plavix for the required period. General impression: I found Option 2 much easier to read and digest. I am not sure the figure works that well. To me, the important thing to know would be the percentage of people who need repeat procedures. I suggest testing a version of the figure that only shows that information. You could still have the number of people who don’t need a repeat procedure explained in the text.